Tyson Fury and Deontay Wilder face off ahead of their heavyweight title fight Saturday night at the Staples Center in Los Angeles. Saturday’s title bout between WBC heavyweight titlist Deontay Wilder, 40-0 (39), and lineal champ Tyson Fury, 27-0 (19), is unique in many ways, and perhaps the thing that stands out most is this: it’ll feature the most awkward and unconventional knockout artist ever in Wilder, and one of the most awkward and stylistically difficult out-boxers in heavyweight history in Fury. And each represents the second legitimate world-class opponent the other has faced. In Wilder’s last bout this March, he scored the defining victory of his career when he stopped undefeated Luis Ortiz in the tenth round of a fight in which he’d only won three rounds conclusively. Fury, on the other hand, scored his signature win back in November of 2015 when he won a twelve-round unanimous decision over lineal champ Wladimir Klitschko. Since Fury beat Klitschko, Wilder has fought five times encompassing forty-four rounds; while Fury has only fought twice, logging fourteen rounds—and that fact alone makes it hard to pick against Wilder. Because of the fighting aptitude of the fighters and their styles, however, is Fury’s chance of winning—if he isn’t cold-cocked—such a reach? In most boxing circles, Wilder is viewed as a huge puncher capable of knocking down a tall building. But I don’t see that necessarily being the case. Lennox Lewis had a bigger right hand than Wilder; Wladimir Klitschko had a bigger left-hook and right hand; and former contender David Tua was definitely a bigger single shot puncher than Wilder seven days a week and twice on Sunday. Wilder has one punch in his arsenal that’s proved to be a game-changer and that’s his right cross, which has a minor arching loop to it. Deontay isn’t a born puncher and many of the second-tier opponents he’s faced have gone rounds with him and have absorbed a few of his right hands along the way without ever being shook (before he finally landed the perfect one to end the fight). The problem is that Wilder needs the ideal situation presented to land his right with true finishing power. He needs extension but can’t overreach with it; and if he’s inside of mid-range, it lacks concussive power because Wilder lacks short power. Another thing about Wilder technically that may help Fury is that, other than his right hand, he doesn’t possess a single weapon that should cause Fury any trepidation. Wilder isn’t a good fundamental boxer, he’s been out-jabbed by a novice like Gerald Washington, and he telegraphs and winds up with most of his big shots. He also has terrible balance and not much boxing intuition. Basically, Wilder goes into the ring with the mindset of, I’ll throw some scattered lefts and rights to get my opponent to forget about the right hand, and when I sense they’re open for it—bam!—I’ll let it go and that’ll be the fight. But he really doesn’t do much to set it up and more or less wings it. With a win over Wladimir Klitschko, Fury has already defeated a bigger puncher than Wilder. In addition to that, Wladimir was a much better boxer than Wilder is, and much physically stronger. So with that, you’d automatically conclude Wilder should be easier for Fury than Klitschko was. But let’s not make too quick a conclusion. There are two obstacles Fury needs to overcome that he didn’t face when he fought Klitschko in late 2015. The first is that he’s been inactive for two and a half years and fought only twice since against two fighters who simply represented a live body. But Fury is much more experienced and well-rounded than Wilder, and he hasn’t forgotten how to box (as long as his stamina doesn’t betray him because of the inactivity he’ll be trying to shake). The other obstacle is that Wilder is quicker than Klitschko and he lets his hands go more freely—especially if he feels he’s behind or the fight is getting away from him. The upside of that is that Fury will get some great open looks at the open Wilder; but he’ll also need to be in alert-mode when Deontay is cutting loose with desperate and bad intentions. In reality, Klitschko only landed a few solid shots on Fury’s chin because Fury didn’t let his hands go with any urgency throughout the fight. So the question of how big a punch Fury can take is still unanswered. And it’s highly unlikely Wilder will be judicious with his offense. When Fury turned pro, he weighed 261 pounds for his debut, and Wilder weighed 207 a month later for his. For his last bout, Fury was 258, eleven pounds more than he was for the Klitschko fight. For his last bout against Luis Ortiz, Wilder was 214. The point here is that Fury, although not much of a puncher, is bigger and physically stronger than Wilder. Fury also knows how to use his weight and he isn’t above straying from the Marquess of Queensberry rules. Typically, Fury doesn’t impose his size on his opponents other than using his reach—but he uses the ring and fights on the move and he’s quite capable of tying his man up and shutting him down. That said, in recent pictures Fury seems slightly gaunt and drawn so that is somewhat of a concern. The path leading to a Fury win isn’t the trickiest one. And the fact that Fury doesn’t intend to win the fight by stoppage will make it simpler. Like Muhammad Ali, Fury would rather humiliate, mock, and embarrass his opponents than knock them out. Aside from looking to use his weight to wear out the lighter Wilder, Fury will need to mix two things stylistically with no middle ground. In essence, he’ll need to be either in or out. Being out will translate into keeping the bout at long range while picking up his feet and turning. That’ll help negate Wilder’s looping shots sent to where the target is, instead of where it will be; and based on history, it’s doubtful Wilder will adjust to it. The other thing that keeping the fight at long range accomplishes is this: it forces Wilder to lunge and reach, especially because he seldom steps with his punches. Forcing Wilder to overextend takes much of the impact off of his big right hands. If that that becomes a pattern, it should be noted, Wilder could become a little undone psychologically, as Fury is the worst guy to have pick up on that during a fight—because he usually feeds off it. And when Fury isn’t out, he must be in; that is, fighting inside and smothering Wilder. Wilder, not being really heavy-handed or a natural puncher, needs room to do damage. On the inside Fury can wrestle and use his weight to tire him, knowing that Wilder isn’t going to hurt him while there with either his hook or uppercut. The worst place for Fury to be during the fight is at mid-range where Wilder can really get torque on his right hand. Deontay Wilder has never faced anyone as big or as unorthodox as Tyson Fury. And make no mistake: Fury may clown around and act off-kilter, but he knows how to box and apply the tools he has. He may talk about the way he intends to destroy Wilder, but that’s his way of psyching himself up and helping market the fight. He knows better than to go in and try to take the fight to Wilder and be forced to trade with him. Fury is a boxer first and doesn’t rely on his power to win, making him the complete opposite of Wilder. The biggest advantage Wilder has is connected to his being active and never getting out of shape. On the other hand, Fury was inactive for thirty-one months after beating Klitschko, fighting depression and abusing food, alcohol, and drugs. Granted, he seems to have overcome all that has tormented him, but he’s not the same guy who fought Klitschko. That version of Fury was confident and sharp mentally and physically. If that guy was in the ring with Wilder, I’d see him as the favorite. That said, neither Wilder nor Fury has faced anybody like they’ll see when they touch gloves on Saturday. 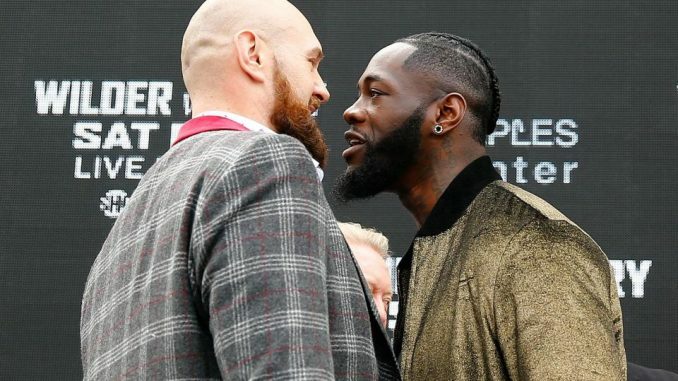 And both have had the advantage of bewildering their opponents with their awkwardness and unconventional boxing styles; but, in this case, I think Fury’s unpredictability will bother Wilder more than Wilder’s out of control style and tempo will bother Fury. The only case for Wilder is his right-hand power—aside from that Fury can cope with his speed and one-dimensional offense. Wilder is a terrible boxer with little boxing intuition, but his right hand exploding against Fury’s chin could erase all of his deficiencies. If Fury is as smart in the ring and sees Wilder’s vulnerability as much he appears to, he has a great chance to make Wilder look foolish and inept by staying all the way in or all the way out. But if he tires, he could become vulnerable to Wilder’s activity, speed, and right hand—and that makes it a tough fight to handicap. Fury is no doubt the better fighter and technician, but his inactivity keeps me from picking him to win although I wouldn’t consider it an upset if he did. I pick Wilder.